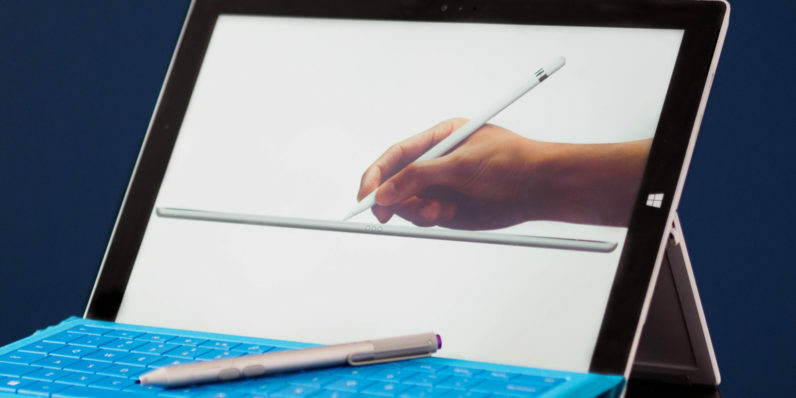 Microsoft may be making a Surface-like keyboard for... the iPad? Microsoft may be making a Surface keyboard for… the iPad? Here’s your unexpected tech news of the day: Microsoft might be working on an iPad keyboard cover. Or it was. We’re not sure. WinFuture spotted some documentation on Microsoft’s website mentioning a product called an iPad Touch Cover, which sounds a whole lot like a keyboard. And that would be great, because Apple’s Smart Keyboard is awful. I’m convinced only deluded Apple fans actually enjoy typing on that thing, especially considering there are much better alternatives out there. Granted, this is assuming such a keyboard would be closer to Microsoft’s modern portable keyboards, like the excellent Surface Pro Type Cover. For those who don’t remember, Microsoft once actually made a Surface keyboard called the Touch Cover, and that one was pretty terrible – like typing on a virtual keyboard without the benefits of being on a screen. I’d hope a new iPad keyboard from the company would only resemble the Touch Cover in name. Unfortunately, the documents don’t tell us much. All we know is that there’s a small battery in it, which suggests it have some kid of wireless capability in addition to functioning as a cover. My immediate thought was this was something Microsoft worked on a few years ago and decided to scrap, given the naming. But looking through an internet archive shows there was no mention of such a battery as recently as July 2015, which is the last time the page was captured by the Wayback machine. The site currently says the list was published on April 17 of this year, so it appears the keyboard went unnoticed for several months. So we pretty much have no idea if it will ever see the light of day. Only time will tell.